This is a repost from 2014. DailyMail: Hollywood superstar hypocrite Leonardo DiCaprio has taken over one of the world’s largest superyachts in order to watch the World Cup in style. DiCaprio and more than 20 friends are said to have taken over the 482-foot Topaz while staying in Brazil for the football tournament. The yacht is owned by Sheikh Mansour bin Zayed Al Nahyan, deputy prime minister of the United Arab Emirates and owners of Manchester City FC. The Topaz was custom made for billionaire Sheikh Mansour in 2012 and is the fifth largest superyacht in the world. Seen in the stands wearing a Brazilian scarf around his neck, the 39-year-old actor tried to keep a low profile as he watched the game. However, it was hard for his yacht to do the same considering its imposing size. 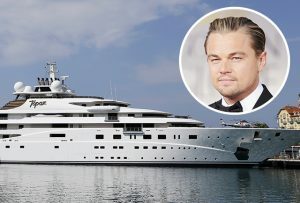 It’s not clear whether DiCaprio and his friends have borrowed the yacht from Sheikh Mansour of if they are renting if off the wealthy Man City owner. It appears Sheikh Mansour and the Hollywood star hypocrite has been in contact about the vessel in the past, as this is not the first time Leo has thrown a party on the Topaz. In April this year, Leo teamed up with Jamie Foxx and Orlando Bloom to host an 80s themed party on the Topaz in New York. Whoever is paying, if Leo of his guests tire of the football there is plenty for them to do on the Topaz. The stunning vessel features a deck top Jacuzzi, a swimming pool, fitness hall, cinema and large conference room. And if getting to the games is a problem, the yacht also has not one, but two helicopter land pads. So much for practicing what you preach. Ride that massive yacht and party like it’s not emitting any carbon! HYPOCRITE. This entry was posted in Culture War, Fear Mongers, Global Warming / Climate Change, Hollywood liberals, liberal hypocrisy, Liberals/Democrats/Left and tagged #boycotthollywood, Brazil, do as I say, hypocrites, Leonardo DiCaprio, not as I do, Sheikh Mansour bin Zayed Al Nahyan, The Topaz yacht, United Arab Emirates, World Cup. Bookmark the permalink. I wish I knew exactly the amount of fuel used by such such a vessel, but I do know that it is tremendous. And the yacht is owned by a billionaire she gained his fortune through petroleum, money we spend at gas stations and for heating some of our homes. Will Leonard get a Nobel Prize for his speech? How many polar bears were saved? Seals not eaten?